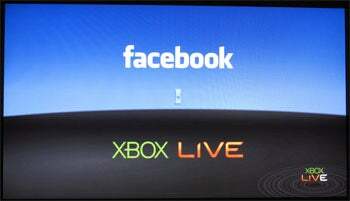 Fire up your Xbox 360 later today and you'll discover your social network just broadened by a factor of two. Microsoft teased Xbox 360 Facebook and Twitter integration at E3 this summer and rolled it out to beta testers several weeks ago, and it's finally available to everyone starting today. 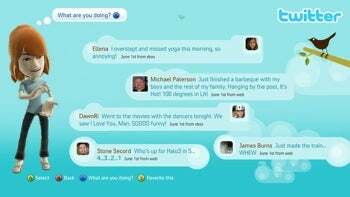 While Twitter comes across full-featured and straightforward enough, Facebook's been tailored to take advantage of the Xbox 360's dashboard, meaning some bits make the leap while others don't. Functions like photo-viewing, friends lists, and status updates get slotted into discrete panels, allowing you to browse options like sorting through a deck of cards. Drill on one and it spreads additional menu options across a series of laterally selectable panels. Photo albums load quickly and scale well on high-definition LCD TVs--arguably a better viewing experience than crowding around a computer or flipping through a browser littered with ads and other interface distractions. You can also pick through your Facebook friends list and see if anyone's cross-linked their Xbox Gamertags, then request to bridge those across to your Xbox LIVE account. The default 'news' view where you can monitor status updates had quirky stuttering issues during the beta. I just downloaded the latest version of the Facebook client (you have to grab it manually--it's not dashboard-native) and the issue's been completely remedied. In fact the whole interface feels slightly more responsive in the final version. Videos, casual games, and other Facebook apps are off limits for the time being, so don't come looking for a comprehensive conversion. Also: Unless you have a USB keyboard, or an Xbox 360 keypad, you'll have to input text by tapping buttons and pulling triggers with your gamepad. On balance, though, Microsoft's done a fine job integrating Facebook's key features and giving Twitter an even more elegant interface than the service's native browser-based one. Where's Sony in all this? The company just announced on its official PlayStation blog that upcoming firmware update v3.10 will add Facebook and Twitter functionality to the PS3's XMB interface. 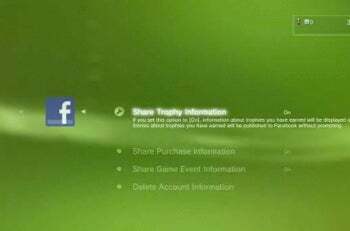 "By linking your PlayStation Network account to your Facebook account, you will have the option for the PS3 to automatically update your Facebook News Feed with Trophy and PlayStation Store activity," writes PSN director Eric Lempel. "This update also enables developers to set specific criteria in their titles to publish additional game information to your News Feed. You can then check out your updates, and those of your friends, on Facebook, Twitter, and other social media favorites through the PS3’s built-in web browser."